Macreme evil eye with hand painted copper plate..Door-wall hanger. 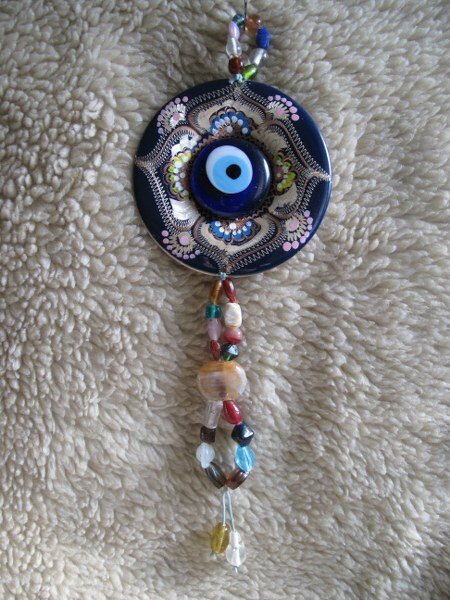 Wherever you go in Turkey you'll see evil eye beads.They hangover doorways car ,mirror inside of the car etc..Those evil eye beads are handmade and they protect you from evil eyes and also protect you looking at you in envy .Its length is 31cm(12,2 inc) .Plate's diameter is 10,5 cm (2.5 inc). Hand painted copper plate.Please visit my other items.Thank you for visiting.